Bake day again yesterday. Six loaves - three regular baguettes and three with roasted garlic and cheddar. Moe's afternoon snack - baguette with six year old Balderson Cheddar. I have been feeding my sourdough starters the last couple of days (they have been sadly neglected) and last night before bed I used some of the starter to make a biga. This morning I kneaded up a double batch of sourdough French bread and will either bake later this afternoon or leave it in the fridge for a day or two to develop. I love homemade bread - and what a perfect snack!! Looks perfect, Ann - as always! I've been so inspired by your lovely bread that I am attempting a sourdough starter. It's a bit cool in our house, but I've put the starter in a cooler with a jar of hot water that I keep replenishing. No action yet, after 36 hours, but I'll keep going for awhile. Lorrie, do you have a light on your exhaust fan (over your stove). If so you might try leaving your starter on top of the stove with the light on overhead. Just don't leave the starter directly under the light. That would be too hot. Are you using the sour dough starter recipe from Amy's Bread? 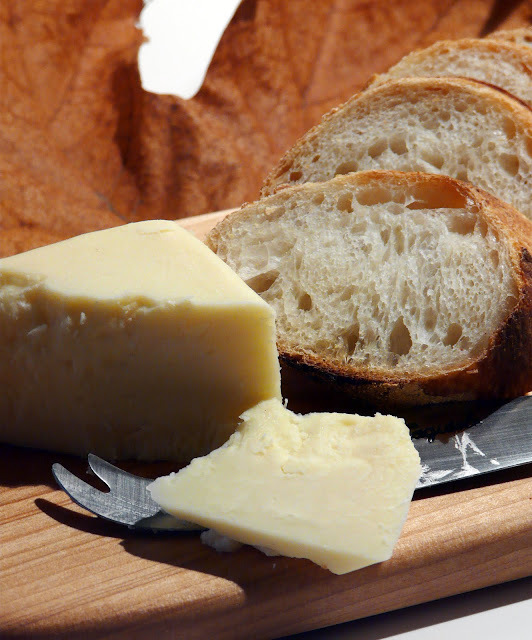 What a treat, your fabulous bread with really well aged cheese and roasted garlic. Moe is a lucky man! Ann, I'm going to look up Balderson Cheddar. I'm wondering if it is one of your local cheeses.